The evolution of social media and how teens and parents fit in. 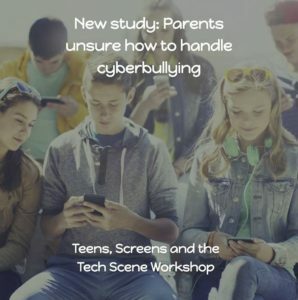 Two very telling surveys were released this month that can give us insights on how both teens and parents are adapting to the world of technology. As the new school year started, Microsoft shared a new study that was encouraging. Teens around the world are finally turning to their parents or a trusted adult for online issues. Common Sense Media conducted a national survey to find out exactly how teens are using their phones and how they feel about social media in a report, Social Media, Social Life. In 2012, Common Sense Media had released the original survey. Since the first Common Sense survey, smartphone ownership among teens has more than doubled from 41 percent to 89 percent. Although almost half of teens (47 percent) believe they are addicted to their phone, only 24 percent believe they are addicted to social media. It’s more likely they are attached to their texting since that is considered their first line of communication today. Eighty percent text on a daily basis which is up from 68 percent from the 2012 survey. What social playground is popular now? We know that parents still are very active on Facebook according to the latest PEW Research survey, but when it comes to the young people (Common Sense 2018 survey), it has fallen off a cliff! In the 2012 survey 68 percent of teens claimed Facebook as their go-to social platform, today it’s fallen to only 15 percent with Snapchat being their favorite at 41 percent followed by Instagram by 22 percent. Incivility online overall is on the rise over the past six years. Nearly two-thirds of teens (64 percent) say they have seen raciest, sexist, homophobic or religious-based hate content on social media platforms (Common Sense survey 2018). We frequently hear about cyberbullying, according to the Common Sense survey, 13 percent of the teens have been bullied online. The good news is 23 percent of teens have tried to help someone online when they witness digital harassment. Almost half of teens (42 percent) when faced with online issues are finally turning to their parents, while 28 percent said they sought advice from another trusted adult such as a teacher, coach or counselor according to the new Microsoft survey. Like the Common Sense survey, Microsoft was able to compare their results to their earlier one. It’s very impressive that from a year earlier, only 10 percent of teens would turn to their parents and today it’s increased by 32 percent. The same is true for a trusted adult. It was only 9 percent a year ago and now it’s 28 percent, a 19 percent increase. Are parents and communities finally realizing the urgency of talking about online safety and civility? The fact that the majority of our young people’s lives evolve around both their smartphones and social media? Is it the headlines of cyberbullying or bullycide that has parents concerned? Awareness is key – and is just as important as these lines of communication. In addition, adults and teens across the globe say parents are by far the best placed of any group to keep young people and families safe online. Results show parents have both the greatest potential — and were deemed the most effective — at promoting online safety among young people, teens and families. 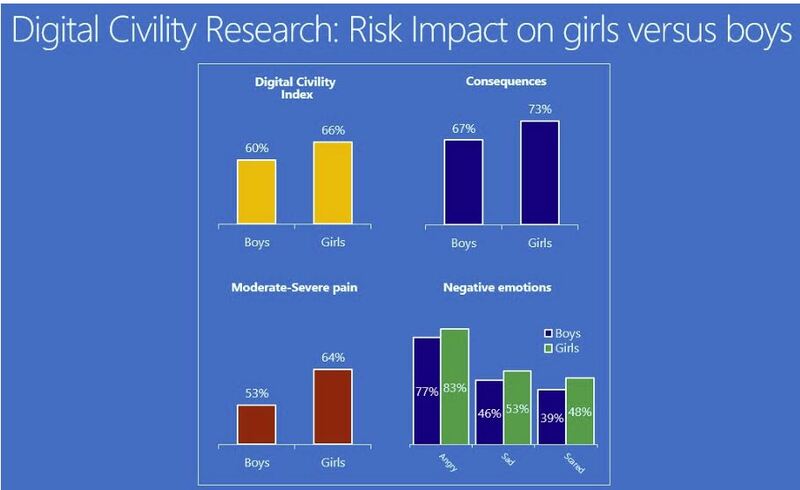 Online life is generally harder for girls, in the latest Microsoft survey it revealed that teen girls were likely to ask for help from parents more than boys by a small margin ( 44 percent of girls vs. 37 percent of boys). Live the “Golden Rule” and treat others as you would like to be treated by leading with empathy, compassion and kindness, and affording everyone respect and dignity both online and off. Respect differences by honoring diverse perspectives and, when disagreements surface, engage thoughtfully and avoid name-calling and abusive language. Pause before replying to comments or posts you disagree with and refrain from posting or sending anything that could hurt someone, damage a reputation or threaten someone’s safety. Stand up for yourself and others if it’s safe and prudent to do so; also, report illegal and abusive content and behavior and preserve evidence. Take the time to review both the surveys. Being an educated parent and community member can help you help the next generation have a safer online experience. Keep in mind, our kids will always be an app ahead of us, but they will always need your parenting wisdom. Sign up today. Click on the image. Will We Be Living In A “Shame Nation” In 2019? Does Your Teen Have Tools to Handle Cyberbullying? What Is Our Responsibility In the Rise of Shame Nation? Could Moms Be the Biggest Reason for Body Shaming? Will You Delete Your Facebook Account? Was 2017 the Rise of Online Shaming? 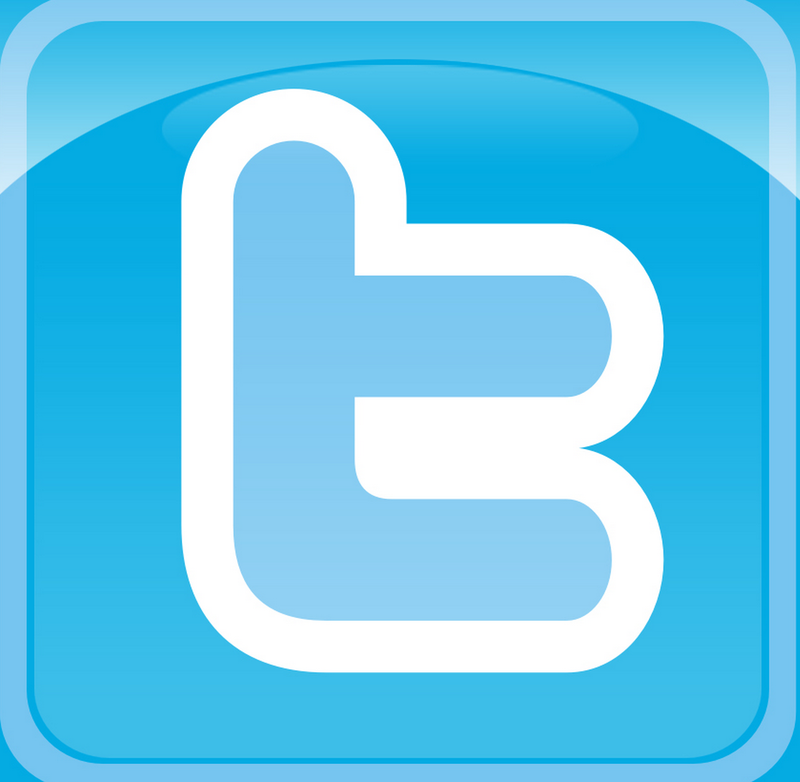 What Is Curbing the Impact of Cyberbullying on Teens? Will Online Shame Prevent You From a Holiday Romance? CyberParenting: Are Your Actions Helping or Hurting Your Kids? Bullying and Cyberbullying Breakdown: Mean, Rude or Bullying?